For nine months each year, and sometimes more, teachers inspire children to learn and achieve. To me, it sounds like they are ready-made Optimists. 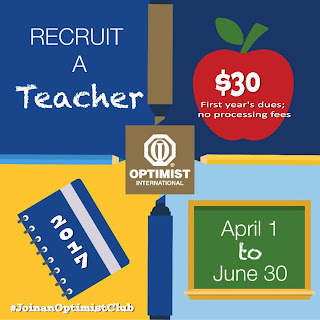 For the second year, Optimist International agrees, and it has extended its popular Recruit-a-teacher membership incentive for the third quarter of the 2016-2017 administrative year. A strong connection with local schools is extremely beneficial for your Optimist Club. More teachers on your roster strengthens this connection. They can open doors for attracting more students to our youth projects - including Oratorical, Essay, Sports and other programs. Teachers are able to provide first hand insight into the needs of the children of your community. Provides the foundation for new Junior Optimist Clubs. Your Optimist Club will serve more children! I think there are even more reasons than above. One that especially stands out to me - we often hear that teachers reach into their own pockets to provide school supplies to their classrooms and students. Wouldn't that make a wonderful project for your Optimist Club? If only the teacher knew how to get in touch with you! Expand the reach of your Optimist Club and provide more service to your community through the Recruit-a-Teacher incentive. Together we can make a difference in every school throughout the land. Happy recruiting! *This promotion is for new Optimist Members only. It may not be used in conjunction with any other membership promotions, including "Friend of Optimist." Clubs will be billed $30.00 at the time the teacher is added to their roster and then will not be billed dues for that Member for a calendar year.